AFRICA POLITICS AND WORLD - тема научной статьи по истории и историческим наукам из журнала "Азия и Африка сегодня"
﻿дией тонущей» (р. 87). Именно этот процесс происходит в Индии, занявшей по числу долларовых миллиардеров 3-е место в мире после США и КНР. Бедность в стране постепенно сокращается, но в этом состоянии остается около 300 млн человек. Работа П.Вармы написана живо, с глубоким пониманием остроты и сложности темы. Его анализ положения среднего класса Индии помогает понять основные закономерности, возможные сдвиги и препятствия на пути становления среднего класса в одной из крупнейших экономик мира. (Moscow, 2014, 296 p., in English) contains a selection of papers dedicated to discussing the nature of the contemporary international relations and foreign policies of African countries. The collective work aims to analyze various aspects of the present-day political and economic situation on the African continent and seeks to contribute to the study of Africa's increasing global importance. 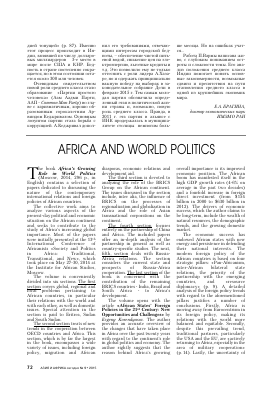 Most of the papers were initially presented at the 13th International Conference of Africanists «Society and Politics in Africa: Traditional, Transitional, and New», which took place on May 27-30, 2014 at the Institute for African Studies, Moscow. The volume is conveniently divided into six sections. The first section covers global, regional and local problems pertaining to African countries, in particular their relations with the world and with each other, as well as domestic issues. Special attention in the section is paid to Eritrea, Sudan and South Sudan. diasporas, economic relations and development aid. The third section is devoted to analyzing the role of the BRICS Group on the African continent. The issues discussed in the section include, inter alia, the influence of BRICS on the processes of regionalization and globalization in Africa and the role of Asian transnational corporations on the continent. The fourth section focuses entirely on the partnership of China and Africa. The included papers offer an in-depth analysis of the partnership in general as well as country-specific studies. The next, fifth, section deals with Russia-Africa relations. The section considers the current state and prospects of Russia-Africa cooperation. The last section of the book is concerned with the contribution of the remaining BRICS countries - India, Brazil and South Africa - to Africa's development. overall importance is its improved economic position. The African boom has manifested itself in the high GDP growth rates (4-6% on average in the past two decades) and a fourfold increase in foreign direct investment (from $154 billion in 2000 to $630 billion in 2012). The drivers of economic success, which the author claims to be long-term, include the wealth of natural resources, the demographic trends, and the growing domestic market. the future world order serves as a significant impediment to implementing Africa's strategic plans. The author's main thesis follows that Africa's role has significantly grown over the period, yet its overall position in the world remains precarious given the existing imbalances in the system of international relations. The article «Analysis of the Humanitarian Situation in Africa South of Sahara (The Case of the Great African Lakes)» by Natalia Sepeleva offers a brief but informative overview of the socioeconomic situation in the DRC, Rwanda, Burundi, Uganda and Tanzania. Most of the focus is placed on the DRC, where the humanitarian situation is by far the direst. The author argues convincingly that the region's natural wealth, which includes huge deposits of fresh water, gold, diamonds, uranium, etc., has brought about the «resource curse», which is particularly affecting the DRC. «Almost every government or armed group participating in the Congolese conflict starts plundering the country's natural resources as soon as they grab some part of its territory» (p. 23). The civil war in the DRC claimed from 4 to 5.4 million lives, and currently there are still nearly 3 million internally displaced persons in the country. The author reasonably believes that in order to stop violence in the Great Lakes region, «it is necessary to regulate the extraction and sales of mineral resources, as well as to expand the regional cooperation» (p. 26). Then the region is very likely to become a major driver of the continent's growth. Intergovernmental Authority on Development (IGAD) (2007). The author correctly points out that the crises in Eritrea's relations with the majority of the neighboring countries «produced an effect of a «besieged state», a state with a degrading national economy, a state that is hostile to almost all of its neighbors and overlooked by most of the international investors active in the region» (p. 28). Zhukov comes to a conclusion that Eritrea's foreign policy in the last fifteen years has been based on the premises that the country will remain «besieged» and that most of the outer world is biased against Eritrea and supports its primary foe - Ethiopia. At the same time, the current isolation of the country is exploited by the Eritrean regime to strengthen its positions domestically. For these reasons, the author concludes that the regime is neither able nor willing to conduct a more peaceful policy in the region. The transformation of the regime itself into a less authoritarian one also seems unlikely. The author convincingly predicts that Eritrea's foreign and domestic policies will remain a factor of regional instability in the foreseeable future. The article «Sudan after the Division with South Sudan: Economic Crisis and Political Instability» by Sergey Kostelyanets describes the socioeconomic and political situation in the post-split Sudan. The author presents an overview of the economic problems the country faced in 2011-2014 and analyses Sudan's anti-crisis program. The program produced mixed results and wasn't able to fully compensate for the loss of oil revenue, which had constituted 60% of the total revenue, after the secession of the South. The paper argues compellingly that «in Sudan, the intrusion of politics into the field of economics is raised to an extreme» (p. 42) and lists the main factors that hinder Sudan's economic recovery: the armed conflicts in Darfur, Kordofan and Blue Nile and the absence of long-overdue political and economic reforms in the country. The author poignantly characterizes the national dialogue process initiated by the government as an ambiguous project lacking the political will, consistency and predictable results. include Anatoly Khazanov's article on anti-American sentiment in Africa and Sergey Seregichev's discussion of an «Arab Spring» scenario for Sudan. БРАГИНА ЕЛЕНА АРКАДЬЕВНА — 2015 г.
ICHIMA E. — 2015 г.
KASAHUN DENDER MELESE — 2014 г.